Home NEWS POSTS Codemint announces the addition of over 2200 new accounting project topics during their recent update. Codemint announces the addition of over 2200 new accounting project topics during their recent update. Codemint, a student’s research website is delighted to announce the addition of over 2200 new accounting project topics during the recent update on their website. This update has followed the need to adapt to the conventional advancements in technology and to include these new digital innovations into the research plan. So far, each of the accounting research topics now embodies elements of the new technology as it affects accounting as a field of study and as an industrial sector. “Academic research is rigorous and dated; as such we are indebted to updating research materials we make available to students” explained Seth Reuben, the lead SEO Consultant, codemint. “Everyday new technology trends emerge and as it were, the world’s attention is tilted to that angle. To make our service relevant in this era, we seek to ensure that students understand the essence of carrying out research on current issues in their field of study” he added. 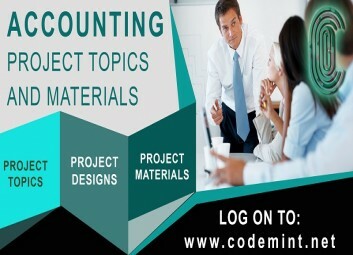 To view the accounting project topics in full, please click https://codemint.net/accounting/accounting-project-topics. Readers may also view the entire codemint resource spot and project research materials for other departments via https://codemint.net/. Lack of research is self-deceit and failure to adapt to conventional advancements particularly as it affects education is ignorance. It is necessary that students get exposed to new trends in their fields of study and indeed their area of specialization even before getting into the industry proper. This is essential because the skills are required; the knowledge is a prerequisite most of the time. So this new update is a way of preparing accounting final year students, specifically for the industrial skill needed for this digital age. This recent update on codemint has included accounting undergraduates, post-graduate students, Masters Students and Ph.D students in the plan. The project topics and materials are categorized to fit the research structure of each of these academic levels. How can accounting students gain access to these new project materials? Accounting undergraduates, HND students, Maters and Ph.D students who seek to benefit from the new update are required to visit the codemint accounting department page provided in the link above. From there, students can search for any topic of their choice. Full access to project materials is not granted at once except on request. Only the Abstracts with the introductory chapter are readily available. How long does it take for students to get the materials, on request? Under normal circumstances, students ought to get the material almost immediately on request. However, other circumstances such as network slowdown could interrupt and could elongate it. All things being equal, students are sure to get the research materials as soon as they make a request. Does codemint support academic misconduct through this service? Not at all; all research materials provided on codemint is intended to provide guidelines, framework and a point of reference to students. As clearly stated in the disclaimer, students are not expected to copy word for word nor commit plagiarism as it were. Codemint is building a community around the academic atmosphere connecting students, scholars and experts. For further details about codemint, visit https://codemint.net/. For enquiries, please send an email to [email protected] or call (+234)906 451 7926.